County Clare is located on the west coast of Ireland. Highlights of the county include the Cliffs of Moher, the rocky Burren landscape, and Bunratty Castle & Folk Park. Shannon airport is located in County Clare. 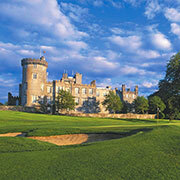 Looking for a truly royal place to stay in Ireland? How about your own private castle? Knappogue Castle in County Clare is near Shannon Airport, Bunratty Folk Park, and the Burren. Doolin Inn (use code IFV in the promotions box when booking!) is an wonderful boutique hotel in Doolin. Perfectly located for touring the west of Ireland – including the Cliffs of Moher and Aran Islands. Bunratty Meadows Bed & Breakfast is convenient to the Shannon Airport, making it perfect first or last night lodging. Bunratty Castle and Folk Park makes a perfect activity for morning or afternoon (see the 2016 updates!). The Medieval Banquet and Traditional Irish Night will leave lasting memories. Take a look ‘behind the scenes’ at the Knappogue Castle most visitors don’t see. The Cliffs of Moher are Ireland’s number one natural tourist attraction. Breathtakingly beautiful scenery; climb O’Brien’s Tower for even more dramatic views. For a different view of the Cliffs, take a Cliffs of Moher cruise from nearby Doolin. If you enjoy hiking consider traversing all or part of the Cliffs of Moher Coastal Walk. Learn more about the walk and the shuttle bus service (podcast). Stay a few days in the Burren and see how much there is to discover! Walk through Ireland’s ancient – and more recent- history at Craggaunowen, the Living Past Experience. Some of Ireland’s most incredible megalithic tombs are found in the Burren. Eat at Nelly’s. Durty Nelly’s, that is. For nearly 400 years travelers have found comfort in this pub that sits in the shadows of Bunratty Castle. ‘Hungry’ for more? Watch my fireside chat with Maurice Walsh, Durty Nelly’s charming manager. Eat at The Long Dock on the Loop Head Peninsula. We enjoyed a meal here so I completely endorse this review! Get the 411 on County Clare – where to go, where to stay and what to eat! Follow Ireland Family Vacations’s board County Clare, Ireland on Pinterest.